What kind of buildings will be in the smart cities of tomorrow? While the cities of the future will still be home to older historical and other buildings that are not energy-efficient good citizens of the power grid, the move will increasingly be to smart green buildings. That explains why the global market for smart green buildings is expected to grow at a compound annual rate of 39.7% between 2016 and 2022, according to a new executive summary from Brisk Insights. The report, “Green/Intelligent Buildings Market By End Users (Healthcare, Medical Equipment And Accessories Suppliers/Pharmacies), By Product (Component, Type Of Transaction, Mode Of Delivery, Edi Van, Mobile Edi), Industry Size, Growth, Share And Forecast To 2022,” costs $3,800 and you might want to add it to your professional library. In today’s post, we would like to share some of the traits of smart green buildings, as laid out in the report. 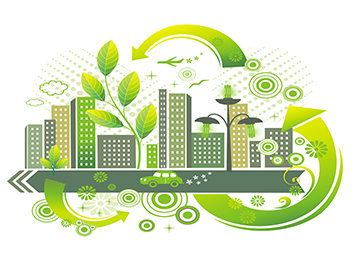 What Do Smart Green Buildings Do? Use materials that include recycled metal, fiberglass, lumber and mineral wool that are non-toxic, energy-efficient and renewable. Generate renewable energy onsite through wind power, biomass, solar and geothermal power. Use low-energy-consuming appliances to lower operating costs. Harvest rain water for internal use to decrease water use and wastage. Employ intelligent controls and building automation to manage plumbing, water and electrical use, solar efficiency, communications, parking, elevators and escalators and other systems.